Today, Ricoh announced that they would be releasing a new compact camera in the Pentax K-70, a 24-megapixel APS-C sensor DSLR. The new K-70 was designed with outdoor photographers in mind, and comes with dustproof and weather-resistant construction. It’s capable of withstanding temperatures down to 14 degrees Fahrenheit. Priced at $649.95, the K-70 is available for pre-order now, but we won’t know when it will actually release until July. 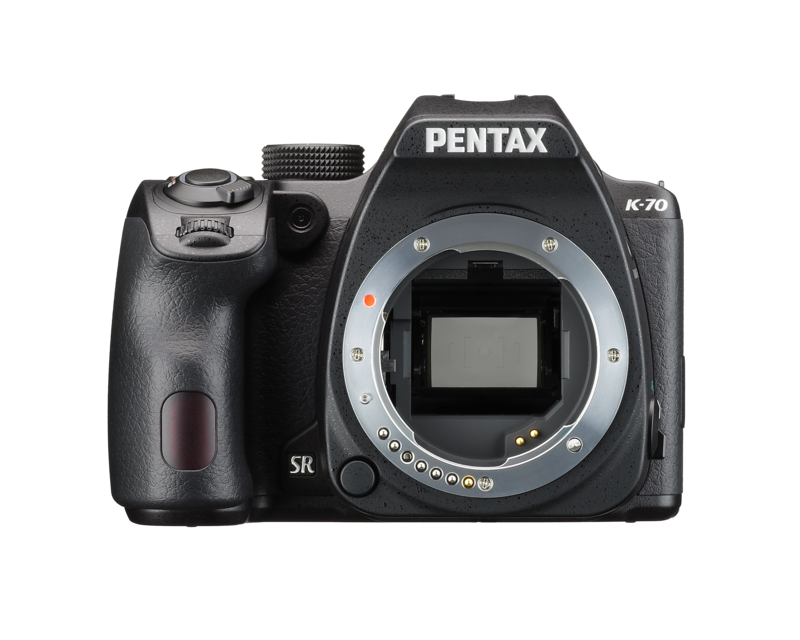 Despite the price, the K-70 comes with features that have, until now, been relegated to the higher-end of Pentax’s K-series. This includes the new AA (anti-alias) Filter Simulator and the Pentax Pixel Shift Resolution System. One interesting new feature is the vari-angle Night Vision Red Light LCD, for those who like to shoot at night. In addition, Ricoh also announced a new lens, the HD PENTAX-DA 55-300mm f/4.5-6.3ED PLM WR RE lens. Like the K-70, the HD 55mm telephoto lens is compact and built to be weather-resistant. It’s priced at $399 and proves the 35mm-equivalent range of 84.5-460mm. Like the K-70, the availability of the new lens won’t be available until July. See the press release below for more details and full specifications. With a newly developed image accelerator unit providing a top sensitivity of ISO 102,400, plus the PENTAX-developed PRIME MII image processor, the PENTAX K-70 is capable of capturing high- quality images in extremely low-light conditions. A new Hybrid Autofocus (AF) system, integrating both image-plane phase-matching and contrast-detection autofocus technologies, delivers fast and accurate autofocus, and—in a PENTAX “first”—continuous autofocus is available for HD video recording. The PENTAX K-70’s exterior is designed with outdoor operations in mind. Features such as a newly designed grip, mode dial and control buttons on the camera’s top and back panels are designed to be easy and intuitive to operate, even with a gloved hand. It also comes equipped with an outdoor- friendly LCD monitor with an illumination control that can be instantly adjusted to the lighting level of any shooting location. The K-70 also has a red-light display function which keeps ambient light from interfering with astro- and nightscape photography. In conjunction with the PENTAX K-70 camera, Ricoh Imaging is announcing the HD PENTAX-DA 55- 300mm f/4.5-6.3ED PLM WR RE lens, a compact, weather-resistant telephoto zoom (see details in separate news release, also issued today); plus the Cable Switch CS-310, a remote shutter release designed especially for use with the K-70. © 2016 Ricoh Imaging Americas Corporation. All rights reserved. All referenced product names are the trademarks of their respective companies. The PENTAX K-70 features a state-of-the-art CMOS image sensor with approximately 24.24 effective megapixels to assure high-speed, 14-bit image data readout. Combined with an AA- filter-free optical design, this image sensor delivers super-high-resolution images. Also, by coupling a newly developed accelerator unit with the high-speed PRIME MII imaging engine, the PENTAX K-70 effectively minimizes noise at all sensitivity levels, and captures richly gradated, finely detailed images at high ISO. The PENTAX K-70 employs PENTAX’s first Hybrid AF system during Live View autofocus operation. By positioning a contrast-detection AF sensor with superior focusing accuracy and a phase-matching AF sensor on the image sensor’s surface, this innovative hybrid system optimizes the benefits of both AF systems to assure high-speed and accurate auto focus. The PENTAX K-70 combines a compact, body with dustproof, weather-resistant construction and outstanding cold-weather performance at temperatures down to 14° F (-10°C). It features a new contoured grip design and easy access to mode dial and control buttons. The LCD monitor features a brightness level that can be instantly adjusted to any environment, and also red-light mode which keeps ambient light from interfering with astronomical photography. The PENTAX K-70 features the high-precision SAFOX X AF sensor module, which assures responsive, dependable autofocus operation. With its 11 sensors, including nine cross-type sensors in the middle, this AF module assures pinpoint focus on the subject at a minimum brightness level as low as -3 EV. The PENTAX K-70 assures outstanding AF tracking performance with subjects on the move, thanks to such advanced features as the Select-area Expansion function, which automatically refocuses on a moving subject after it moves away from the initial point, with the help of the neighboring points; and an AF Hold function that maintains the initial in-focus point even when the module loses sight of the subject. Using the built-in PENTAX-original SR (Shake Reduction) mechanism, the PENTAX K-70 effectively minimizes camera shake and delivers sharp, blur-free images, even in camera- shake-prone conditions. Capturing four images of the same scene by shifting the image sensor by a single pixel for each image, the Pixel Shift Resolution System* then synthesizes them into a single composite image. This innovative system obtains all color data in each pixel to deliver super-high- resolution images with far more truthful colors and much finer details than those produced by conventional APS-C-size image sensors. A motion correction function**, which automatically detects a moving object during the synthesizing process, to accommodate a wider range of scenes and subjects. By applying microscopic vibrations to the image sensor unit at the sub-pixel level during image exposure, the PENTAX K-70’s AA (anti-aliasing) filter simulator*** provides the same level of moiré reduction as an optical AA filter. Unlike an optical AA filter, this innovative simulator lets the user adjust the level of the moire correction. Since the PENTAX K-70’s SR unit has a flexible design that shifts the image sensor unit in all directions, it provides a host of handy shooting functions, including ASTRO TRACER, which simplifies advanced astronomical photography when combined with the optional O-GPS1 GPS Unit. Within its compact body, the PENTAX K-70 incorporates a glass prism finder featuring the same optics and coatings as those used in higher-level models. A nearly 100-percent field of view and a magnification of approximately 0.95 times provides a wide, bright image field for easy focusing and framing. With a top shutter speed of 1/6000 second coupled with its high-speed continuous shooting function of up to six images per second, the K-70 is is perfect for capturing fast moving subjects at sporting events or wildlife. The PENTAX K-70 captures high-resolution, Full HD movies with stereo sound using a built-in stereo microphone. In combination with compatible lenses, it allows the user to use the Continuous AF (AF-C) mode* to keep accurate focus on a moving subject, or take advantage of a new aperture control function** to automatically assure a proper exposure level even in fluctuating lighting conditions during movie recording. It also provides a host of distinctive visual effects for movie production, including the 4K Interval Movie mode that connects a series of 4K-resolution still images at a fixed interval to create a single movie file, and a Star Stream mode to fade in and out the traces of stars to recorded movies. * During movie recording, the Continuous AF (AF-C) mode can be used in combination with the HD PENTAX- DA 55-300mm F4.5-6.3ED PLM WR RE or smc PENTAX-DA 18-135mm F3.5-5.6ED AL[IF] DC WR lens. Access the RICOH IMAGING official website for details. The PENTAX K-70’s vari-angle LCD monitor allows for the positioning of the monitor at any desired angle, making it easier to compose the image in a wide variety of applications. The PENTAX K-70 provides three USER modes and two Fx (Function) buttons, to which the user can assign desired camera settings depending on their shooting preferences. Three settings (CLEAR TONE, HDR LANDSCAPE and ASTROPHOTO) are preprogrammed in the camera as default. By installing the dedicated ImageSync application on a mobile device, the user can remotely check the Live View image, capture still images, adjust such camera settings as aperture, shutter speed and ISO sensitivity to the desired level through the mobile device, as well as download captured images onto the mobile device, then upload them on social networking service websites. Attached to the PENTAX K-70’s microphone terminal, this one-meter-long cable switch helps prevent camera shake when using a macro or telephoto lens, allowing the user to release the camera’s shutter without touching the camera. Note: The PENTAX K-70 does not accept cable switches other than the CS-310. Designs and specifications are subject to change without notice.